View of the Hudson from Dominican Camp.Robert Rodriguez, Jr. A former summer camp, this wooded property on the Hudson River offers spectacular views of our Black Creek Preserve, directly across the river, as well as Esopus Island, Shaupeneak Ridge (also a Scenic Hudson park) and the Catskill Mountains. The site also contains 60 acres of federally designated wetlands, including numerous ecologically important vernal pools, and the circa-1769 George Rymph house, listed on the National Register of Historic Places. Located within the Estates District Scenic Area of Statewide Significance—designated by New York's Department of State for possessing outstanding scenic and historic resources—the newly acquired land provides a buffer along a rapidly developing corridor of Route 9 that serves as a gateway to some of the Hudson Valley's most popular historic sites, including the Franklin Delano Roosevelt Home and Presidential Library & Museum, Vanderbilt Mansion and Staatsburgh (Mills Mansion). It safeguards iconic views from parkland across the river and ensures that the property's 700 feet of shoreline will forever remain a public resource. The acquisition also will facilitate the extension of the Hyde Park Greenway Trail along the riverfront, linking all of the above historic sites. 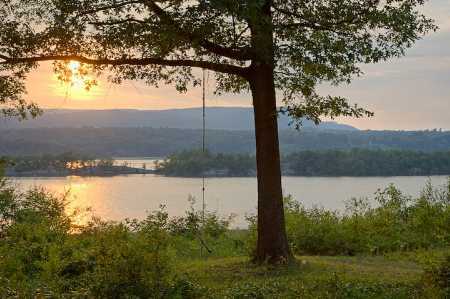 The purchase is part of Scenic Hudson's collaborative campaign to Save the Land that Matters Most, protecting 65,000 acres of great scenic, ecological and agricultural significance.